I had been, at times feverishly, tearing through the collections and anthologies I could find in libraries and through Scholastic Book Services and bookfairs for four or five years by the time I had begun to get to go to bookstores on my own recognizance, as a not quite teen, when I happened upon this volume. Now, I knew there were mystery/crime fiction magazines and science fiction magazines still around, and even The Magazine of Fantasy and Science Fiction hadn't completely escaped my notice by 1976 and I knew it contained at least some horror fiction, but this was one of the first compelling bits of evidence that the great years of horror fiction weren't solely in the past, that there were ongoing traditions and new as well as old favorite writers still enriching the form. In fact, most of the work by the older hands, including Bloch's pleasant story, were among the slighter contributions, though Wellman's story was both solid and fine, Leiber's "Belsen Express" was suitably nasty and Ellison's "Shatterday" was fully up to what I was hoping for from him. The folks new to me, and in 1977 most not so very far along in their careers, such as Wagner, Cover, Drake, Grant and Lee were the even happier discoveries, as was my first opportunity to read H. Warner Munn, whom I'd read referred to, but not yet read...and while his story, an original in what seemed like it should be a reprint-only anthology, was more Count of Monte Cristo adventure than horror story, it was great fun. Wagner would, of course, take up the editorial duties after Page's last volume, the seventh, and continue till his premature and unfortunate (and foreseen) death; it was only a few years ago that I learned that Page had, in the '70s, worked for TV Guide, as I did till the recentish dismemberment of that organization (my usual joke involves a misquotation of Julius Caesar--TVG, actually unlike Gaul, is now in four parts). 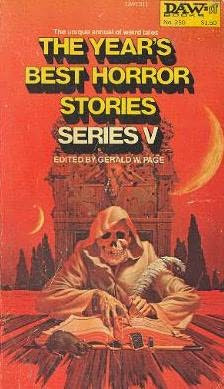 Page's four annual volumes had followed DAW Books's reprints, rather haphazard, of two volumes of a British annual split into three annual books...and while the DAW series died with Wagner, we currently still have two annuals, those of Stephen Jones and Ellen Datlow, which continue the tradition. But this great read, along with with the First World Fantasy Awards and "Hitchcock" volumes I've already cited (and the interstitial material in Ellison's and Asimov's anthologies and collections) helped draw my to the point where I'd be participating in such fannish projects as Patti Abbott's FFB, of which further examples can be found at her blog. Worst forgotten band's name: The Four Plaid Throats. According to r&b and doo-wop historian Lynn McCutcheon, at least as late as the mid-1980s, no one knew who they were and and what, exactly, the deeply coded name meant. Best reunion albums of the early 2000s: Well, two of them have to be the 2001 release God Bless the Go-Go's and the 2002 album (delayed in US release till 2003) Doll Revolution by the Bangles. 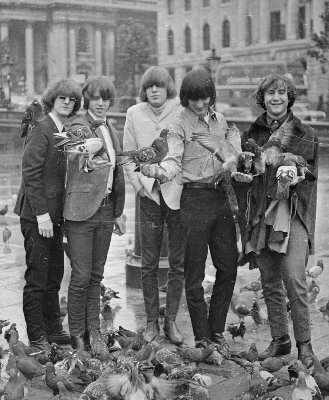 The first two all-women bands to make serious dents on the US pop charts (and that that should take till the 1980s is remarkable in itself, despite the long history of women instrumentalists as well as singers stretching back through such notable performers as Aretha Franklin, Nina Simone, Peggy Lee, and the International Sweethearts of Rhythm, and with such rock-band progenitors as Goldie and the Gingerbreads and Fanny, and of course the Runaways [if you note a somewhat less than self-promoting tendency in the band nomenclature there, you won't be the first]). The Go-Go's came, as anyone who cares almost certainly knows, out of the ferment of the Los Angeles punk rock scene in the latest '70s and early '80s, which would also contribute such bands as X and Fear to the larger world, but the Go-Go's had a much greater pop sensibility than most, being as they were as much the heirs of the Beach Boys in every way as those of the Velvet Underground or the Stooges. The Bangles were playing the same clubs at nearly the same time, but were more of the not-quite punk scene that drew on similar sources...more the garage band tradition than the punk scene that grew out of that (as one fan-historical site notes, former Runaways member Ms. Michael Steele was recruited to replace the departing Annette Zilinskas in the Bangles after the following exchange: 'She won the audition through answering Vicki Peterson's question, "Describe your dream band" with "The Yardbirds with Fairport Convention vocals"'); if the Go-Go's were new-style Beach Boys, the Bangles were the Byrds' chicks, even to exploring country influences in their later work. After careers met with plenty of "hoo boy, these girls play their own instruments!" and "look at their clothes and hair!" and three major commercial albums each in the in early to mid 1980s, both bands broke up, in part from the pressures of their best and most personal work being their least popular in both cases, yet neither band was forgotten by core fans nor the popular culture, and they both sporadically would reform to record or tour, sometimes borrowing members from each other, throughout the 1990s...till the turn of the 2000s, when in the wake of the flourishing and normalization of women in rock and pop it seemed like time for both to make another full-bore collective effort. With these two albums, they brought thoroughly adult and post-superstar perspective to their work, demonstrated that their chops as songwriters, singers, instrumentalists and producers had if anything deepened with the years (and enlisted members of the next generation of pop-punks as collaborators), and both records were met with enthusiastic reviews from the knowledgeable and at best indifferent sales...the label that released God Bless quickly folded, and the US release of Doll Revolution was delayed nearly a year till the adventurous mostly-classical label Koch took up the option. Best (and worst) theremin and orchestra albums of the late 1940s: Music Out of the Moon and Music for Peace of Mind by Samuel Hoffmann and Billy May's Orchestra, reissued together on LP by Capitol in the late 1950s. In digging through the stranger items in my parents' record collection in the 1970s, this hellbeaten reissue was certainly among them...over a syrupy proto-Muzak orchestration, "semi-classical" theremin stylings by podiatrist Hoffmann, most famous probably for the Spellbound soundtrack, played for the ages with the early electronic instrument. "This Room is My Castle of Quiet" (lead off for Peace of Mind) is probably the best recording from either album. 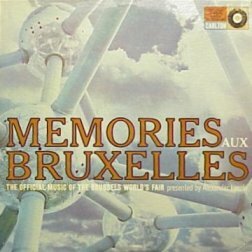 Memories Aux Bruxelles assembled by Alexander Lazlo, assembled for Charlton Records, which was briefly Anita Bryant and Merv Griffin's label. It was through this record's presence among my father's classical recordings (he picked it up after attending the fair) that I was able to "sing" long segments of Edgard Varese's "Poeme Electronique" as presented there. Still can. 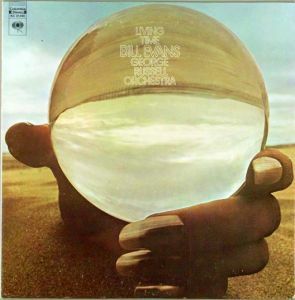 Living Time, featuring Bill Evans (1971, who had the CBS contract and presumably knew how good this album-length composition from his old boss was)...Russell's Living Time Orchestra of the '80s was named for it. The suite suggests the stages of any human life, and it's brilliant (the first Living Time Orchestra release, The African Game, didn't quite trump it except in concept...phylogeny recapitulating ontogeny, a suite about the evolution of humanity). A few fat-headed comments from time to time, but a decent look at this ridiculously seminal band. A day memorializing a man who sought to use the rights we are promised to ensure that we actually have and can use them, and to increase the access to the promises of Life, Liberty, and the Pursuit of Happiness. Not a man who worked alone to do this, nor one who was perfect in any way, but certainly the most deserving of the individuals to whom this country has dedicated a political holiday. I remember when some states wanted to call it Lee-Jackson-King Day, after two Civil War generals, if they were to tolerate or accept it at all. Old stupidity dies really hard. The 1968 Hill and Wang reprint, the version I have. 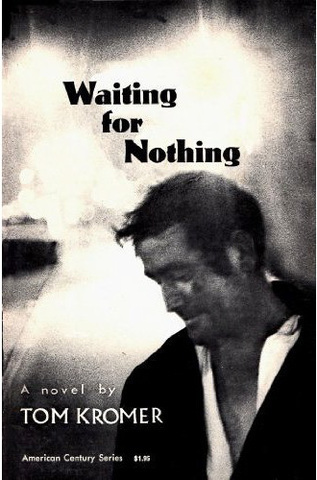 Well, if you're looking for another ancestor of Fawcett Gold Medal's tales of entrapment and despair in the 1950s, this autobiographical novella by Tom Kromer, largely a string of incidents taken from his life as a homeless drifter (or, constantly, a "stiff") during the Depression, will certainly do...James T. Farrell, L-F Celine, and John Steinbeck have nothing on Kromer when it comes to facing the abyss, or another night where the choices are to submit to predatory evangelists, cops (looking for short-term prison-gang labor), or self-deluding chicken-hawks, or another night in the park in the cold rain...or shooting one's self in the head, or taking the slower route by drinking diluted Sterno or straight bay rum. Told in short, choppy sentences and with a not quite completely flattened affect, and measuring the distance between those who want to put on a show of their generosity and those who are simply generous (and those who get their fleeting jollies cursing the bums who Won't Go Get A Job in an all but jobless time), it makes its point. One wonders what became of Kromer...I'll have to look into that. Apparently, while Stratovision wasn't ever used much in civilian circumstances, and at about the time it was being developed Arthur C. Clarke was suggesting artificial satellites might be able to do something rather similar w/o needing to be refueled and replaced as the flight crew grew weary (this ad is from the Winter, 1946 Yale Review, back when Westinghouse, along with a large slew of publishers, would advertise in a little magazine, at least Yale's), Wikipedia details its use during the Vietnam War and less impressive performance during the US bombing of the unpleasantness in Bosnia. Theodore Sturgeon, often in collaboration with Zane Grey's Western Magazine editor Don Ward (in the open in contributions to other magazines, and perhaps in the usual editorial interplay at ZGWM), wrote a series of western stories initially for that fine digest (Zane Grey seems to have been the National Geographic of western fiction magazines...to judge by the eBay population, no one seems ever to have thrown them away...though the issues that Didn't run a usually truncated Grey reprint were the better ones--I have a late one with a much superior Cliff Farrell novella where the Grey mass would otherwise martyr trees). The shortlived Luke Short magazine took one, and as one sees above, they apparently couldn't place two of them before this book was released (though I should go back to check the Sturgeon Project volumes about that). "Cactus Dance" deals with, shall we say, altered perception; "Scars," among other things, deals with the vagaries of love and affection in a typically Sturgeonish way (and these two were the only stories here included previously in Sturgeon's fantastic-fiction collections, despite having no blatantly fantasticated elements to them). As with the other sorts of fiction that Sturgeon tackled, the empathy and clear-eyed analysis of the many ways we can betray and unexepectedly support each other are all over these pages...I'm not sure how much Ward, who might not've produced any solo fiction, contributed, but the collaborations certainly read like Sturgeon. For more Friday books, please see Patti Abbott's blog. The Magazine of Fantasy & Science Fiction: Average number of copies sold or otherwise distributed during the past twelve months (from 1 October 09): 15,937; actual number from the most recent issue at that time: 19.690. So, perhaps the transition to a fat bimonthly rather than a usually slimmer 10 issues per year (with two "double-issues") has been a good move for F&SF. Though it's notable that Fantastic was considered a near-failure of a magazine in '70s for selling in that range, and it waa absorbed by its sibling Amazing not long into the '80s. F&SF celebrated its 60th anniversary in 2009. Tin House: Average during past year (from 20 Sep 09): 11,599; actual number closest to filing date: 12,462. So, this "little" quarterly is racking up solid numbers for that class of magazine, within shouting distance of F&SF. It is rather well distributed, particularly in the big box bookstore chains, for a little. TH celebrated its 10th anniversary in 2009. 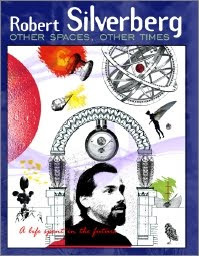 Also notable in the case of Tin House, as with the memoirs of Robert Silverberg, Other Spaces, Other Times (NonStop Press, 2009) is how much the layout of both magazine and the book resembles those of 1960s and 1970s grade-school texts, particularly the more adventurously-designed reading textbooks. James Parker at TH and Luis Ortiz at NonStop are perhaps feeling the early influence of the folks at Scott, Foresman and Silver-Burdett all those years ago.